Within a week of the signing of the Armistice discussions had quickly turned from fighting to bringing the men home with the creation of the Australian Demobilisation and Repatriation Branch. Lieut.-Gen. Sir John Monash (photograph right) returned to Le Cateau and held what would be his last great conference of divisional and brigade commanders to launch his scheme of repatriation and industrial training for the troops preparing to return home. As it was unlikely that Field Marshall Haig would release the troops under his command until February when the peace negotiations might end, it was expected that repatriation would take a year to complete which Monash knew would prove to be a challenge for his men desperate to get home. On the 26th November Monash wrote his ‘Farewell Order’ to the troops of the Australian Corps thanking all the men for their splendid and loyal support of the past six months. The letter laid out the importance of the next few months, to prepare the men for their return home by re-training and acquiring the new skills required to help in the building and development of the Australian nation. Monash knew too how important it was to keep the men occupied and motivated while the repatriation process ground along well into 1919. The priority for repatriation would be based upon i) length of service; ii) family responsibilities; and iii) assured employment. After the ‘Anzac’ contingent, the men that left in the first half of 1915 followed by those in the Australian convalescent bases in London, Monash put in place a quota system that was adopted by each division, with 1,000 men in each quota. In December and January nearly 20,000 men of the ‘Anzac’ and convalescents embarked from England. For the 22nd Battalion now billeted for the rest of their time in the villages of Gourdinne and Marcinelle close to the Belgium town of Charleroi, the drafts for home began on Christmas Eve 1918, when a small party of its married original members said an emotional farewell to their old Battalion. On this and each subsequent occasion the Battalion Band played ‘Auld Lang Syne’ and the Colonel shook hands with each man and wished him ‘bon voyage’. In mid-January the Repatriation and Demobilisation General Instructions were issued which had as its leading principle that for discipline, and the wishes of the Australian Government, that men should be returned by units as far as practicable. For the troops still with their units in Belgium a typical day would consist of parade, rifle exercises, physical exercises and games, but the main activity was Educational classes (example left) which were held in the morning and afternoon. Included were courses such as Book Keeping, Shorthand, Agriculture, English, French, Arithmetic, Geography and History. These courses were held regularly over the next couple of months, together with visits to industrial sites and factories in the Charleroi region. 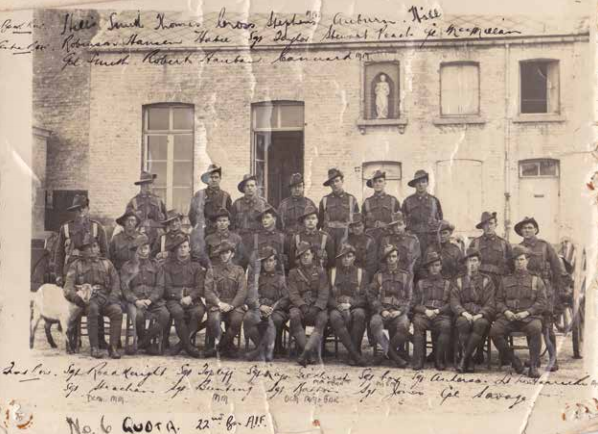 The photograph below right, taken in Gourdinne village square, shows the contingent from the 22nd Battalion that were part of the 6th Quota just prior to their departure from the battalion on the 3rd February 1919 (photograph below courtesy of Jennie Marshall and the Lieut. Harricks collection). Having then departed from Le Havre for Weymouth on the 12th February the men would then stay for another couple of months or so in the Wiltshire based Command Depots such as Codford, as demonstrated by many of the men in the 6th Quota eventually returning to Australia on the SS ‘Castalia’, departing Devonport on the 13th April 1919. In mid-February Prime Minister William Hughes visited the troops and spoke about what was being done about repatriation and his efforts in the Paris Peace Conference. According to the records he was accorded a great reception by the troops and was given a great cheer on his departure. In May 1919 the last 10,000 men of the AIF in France were brought to England where the camps on Salisbury Plain now held 70,000 men. For the men of the 22nd Battalion still in Belgium during the spring of 1919, the hospitality of the citizens of Marcinelle never waned and many happy and lasting friendships were formed. On the 24th May 1919 the final quota (No.57) consisting of 2 Officers and 71 Other Ranks left for England and to begin their return to Australia, and in so doing the 22nd Battalion ceased to function in the field. At this stage Australian soldiers were marrying at 150 a week resulting in 15,000 new partners and children being carried to Australia and New Zealand in 1919, many on the SS ‘Mahana’ also known as the ‘bride boat’ which set sail from England Australia on the 25th September 1919, including the authors newly married grandfather 2394 Pte George Stephens, MM, (6th Quota photograph, back row, third right) and grandmother Minnie Taylor.